Motivated Seller. At this +55 community you OWN YOUR LAND so no share purchase is required. Youll want to take a look at this lovingly maintained home which has been completely renovated in 2006. Nestled along the scenic Shell Creek and Peace River leading to Charlotte Harbor whats not to love. 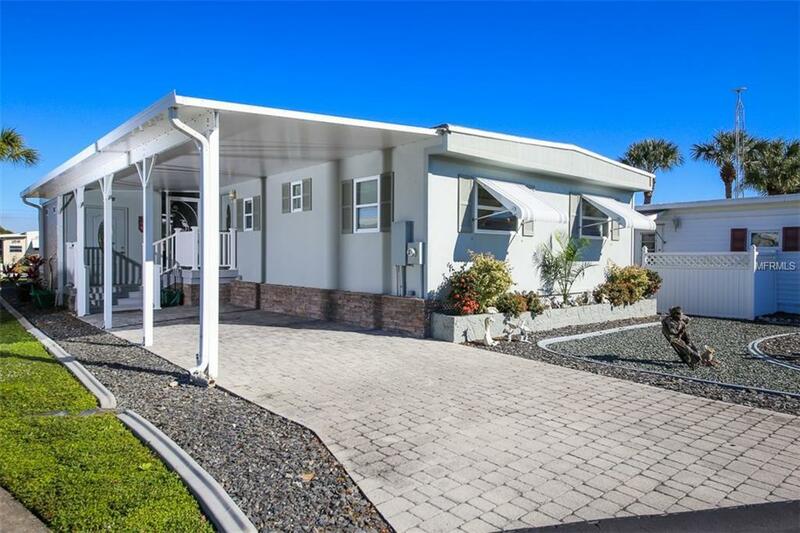 This elevated home has recently been updated to include a newer seawall and newer boat dock and pilings. This bright and spacious home offers 2 bedrooms, 2 baths and a large inside laundry room. Youll love the open floor plan concept. Inside enjoy modernized textured drywall, vaulted ceilings, recessed lighting and tile look interlock laminate floors throughout. The kitchen features wood cabinets, island, modern appliances including ceramic top stove and side-by-side refrigerator. Just off the kitchen resides the living room featuring sliding glass doors to the large deck which is perfect for entertaining and the dock beyond. Enjoy the large master bedroom with en-suite bath. Outside enjoy zero-scape yard, paver drive with carport large enough for two vehicles and storage room/workshop. Enjoy low maintenance fees and amenities within this active community including clubhouse, community pool and shuffle board. Located close to downtown, this home is a short drive to Punta Gordas shops, restaurants, medical facilities and has quick access to I-75. Additional Lease Restrictions Must Be Approved By The Association. 55+ Community. See Community By-Laws For Lease Period Minimum And Maximum. Pet Restrictions No Noted Size Restriction.